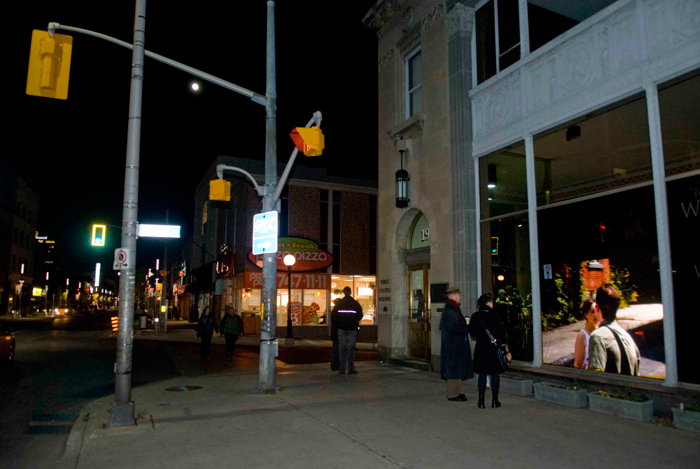 Isabella Stefanescu, Carlito Ghioni & Klaus Engel (Waterloo, ON), American Shot, 2009, rear projection video installation, Critical Media Lab window, 195 King Street West, Kitchener. Photo: Elizabeth Feryn. American Shot is an interactive installation incorporating a screen that is both a real and a simulated mirror. The act of responding to one's reflection -- choosing a position, looking backwards and self-examination -- are stances to which the screen responds with a story determined by the spectator's attention and point of view. American Shot is a translation of "plan americain" an expression used by French film critics of the 1950's to refer to a medium-long shot of a character -- a camera shot originally used in Westerns to explicitly show the gun of gunslinger. When the phrase "American Shot" is encountered out of context, it recalls newspaper headlines rather than of camera work. The micro-narratives at the core of this project explore this ambiguity. This project has been made possible with the support of the Region of Waterloo Arts Fund, Kitchener-Waterloo Community Foundation, Ontario Arts Council, Canadian Film Centre Media Lab, Banff New Media Institute, the Multicultural Cinema Club and Christie Digital. Isabella Stefanescu is an artist from the region who is well known for her work as a painter. However, in recent years she has been active as a developer and collaborator on innovative multimedia projects. With Klaus Engel and Nick Storring she worked on TRANSPORT, an interactive screen project prototyped during a residency at the Canadian Film entre. Also working with Klaus Engel she developed the EUPHONOPEN, a prototype for a drawing instrument that produces music as it draws, based on the concept that drawing, like dancing, is a performance.